Jim Miller has more than 30 years experience in public transportation research, planning, and management. He was a faculty member in Penn State University's Smeal College of Business Administration from 1976 until his retirement in 2003. He directed the Mid-Atlantic Universities Transportation Center from its founding in 1988 until 2002. In addition, he was a program director at the Pennsylvania Transportation Institute and directed a number of research and technology transfer programs at both the state and national levels. 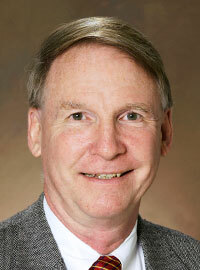 He is active in the Council of University Transportation Centers and served as its president in 2000. He has had a special interest in rural and specialized transit services and helped form policy for Pennsylvania's very extensive shared-ride program. He also helped more than 25 counties design and manage their systems. He was one of the founders and served as chairman of the Centre Area Transportation Authority, the public transit operator for the Penn State/State College, Pennsylvania community. Recently he completed a synthesis of campus transit operations for the Transit Cooperative Research Program (TCRP). In his role as Faculty Affiliate, he is assisting SURTC with its various research projects, and is the instructor for a graduate and upper level undergraduate course on public transportation.